"Radio Frequency Identification (RFID) technology is playing a crucial role for item-level tracing systems in healthcare scenarios. The pharmaceutical supply chain is a fascinating application context, where RFID can guarantee transparency in the drug flow, supporting both suppliers and consumers against the growing counterfeiting problem. In such a context, the choice of the most adequate RFID UHF tag, in terms of shape, frequency, size and reading range, is crucial. The potential presence of items containing materials hostile to the electromagnetic propagation exasperates the problem. In addition, the peculiarities of the different RFID-based checkpoints make even more stringent the requirements for the tag. In this work, the performance of several commercial UHF RFID tags in each step of the pharmaceutical supply chain has been evaluated, confirming the expected criticality. On such basis, a guideline for the electromagnetic design of new high-performance tags capable to overcome such criticalities has been defined. 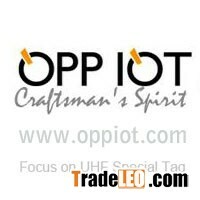 Finally, driven by such guidelines, a new enhanced UHF tag has been designed, realized and tested by OPP IOT.